Are you ready to fall in love all over again with Hawaii? Whether you're a history buff or just someone who's interested in a good story, you'll love Bill Fernandez's historical and adventure books! 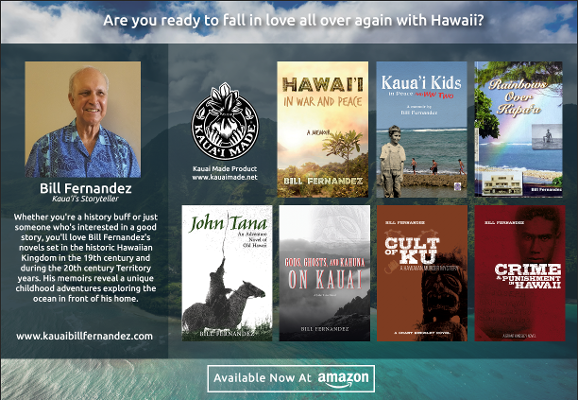 Bill Fernandez Hawaiian Author writes exciting novels and non-fiction memoir books from his home in Kapaa, on Kaua'i. Each one is well researched for accuracy. Add them to your book collection. Some of his works include gorgeous as well as old pictures of his family and Hawaiian scenery. In addition to writing historical novels from the perspective of a Native Hawaiian, Bill enjoys giving talks about Hawaiian history with anyone wanting to learn more about this great state and Native Hawaiians. You're welcome to contact Bill to set up a time and date. No charge. A beautiful PowerPoint slide show plus a chant and some singing create a lively talk. Rainbows Over Kapaa, From Poi to Pineapple, Hawaiian Sovereignty, Kauai Kids in Peace and WW II, Hawaii in War and Peace, and the novel series of Grant Kingsley (Cult of Ku, a murder mystery; Crime & Punishment in Hawaii) and John Tana (An Adventure Novel of Old Hawaii; Gods, Ghosts and Kahuna on Kauai; and Hawaiian Rebellions); Splintered Paddle, a novel of Kamehameha the Great. DVDs of the talks are available at the Kauai History Society office in Lihu'e for $20 each. Contact Bill to arrange a talk for your group. "I saw a side of Kauai tourists never notice," said one person. "Bill's voice is so deep and beautiful, I loved his singing, and his chanting made my skin tingle." Bill served as President of the Kauai Historical Society, is a member of the State of Hawaii Juvenile Justice Advisory Committee, and serves on the board of Hale Opio, a social services agency. Forbes Magazine designated Kapaa as "Among the 15 Prettiest Towns in America" in Sept. 2013. I was lucky to be born on a tiny dot in the Pacific Ocean called Kauai, Hawaii. I graduated from Kamehameha High School and Stanford University then practiced law and became a judge in California. I'm back home living in my mother's old house by the ocean. My wife, Judie, and I have a lot of fun creating the books and talks. I love history, and my formative years were impacted by the Pearl Harbor bombing and living on an island with thousands of GIs under martial law. My first three published books are memoirs describing the pre-war and war years in the islands. Rainbows Over Kapa'a describes my familiy's movie theater, Roxy, built in 1939. More than 1,000 seats, on a tiny island, it was a big risk. Just before foreclosure, Japan bombed Pearl Harbor and months later thousands of GIs arrived. Bored on this tiny island, they kept Roxy hopping. I learned to shine shoes, buy candy and cigarettes for the soldiers. They opened my eyes to the big world out there as they were from Brooklyn and described city life. The fear of invasion, blackouts, beaches blocked by barbed wire, and gas masks replaced my carefree ocean play. Lots of old photographs. My barefoot stories and the family movie theater bring laughter and good times as you learn how to make a tin canoe or challenge the sugar cane trains on the bridges. Kauai Kids in Peace and WW II makes me wonder how I survived challenging sugarcane trains, learning to surf, kite fighting, and dodging the armed military patrols as I sneaked onto the beach at night. Part II, is serious, dedicated to the courageous Nisei soldiers. My Japanese-American friends and family faced racism and possible internment. I end this book as I fly off to Honolulu to attend Kamehameha Schools in 1944. When I land in Honolulu, my next memoir begins: Hawaii in War and Peace. My high school years in Honolulu during World War Two challenged me. The military regimen at Kamehameha Schools for children of Hawaiian ancestry was stressful. The city full of thousands of GIs and sailors was tense as they didn't like locals. It was a complete contrast to my life on Kaua'i. We could not use the beach and were unwelcome in Waikiki. I learned about the Honolulu Harlot, politics, racism, and how to maneuver in a complicated world. A family driving trip around the continental U.S.in 1948 caused me to wonder where I belonged when I witnessed anti-Semitism and the segregated South. But there were also wonderful moments diving in the ocean which convinced me I should stay home and become a fisherman. My parents had other ideas and I headed to Stanford University in 1949. Cult of Ku, the novel features gruesome murders of the political elite in Honolulu in 1920. The hero, Grant, is accused of murdering his grandmother after she threatens to disinherit him. Released from jail he knows he must find the real killer or face trial for several murders of the powerful Caucasian elite. The history of anti-unionism of the plantations, the multi-cultural society, and ancient Native Hawaiian rituals and martial arts plus the advancing winds of war carry the reader into a complex world. A dramatic ocean-side fight at an ancient temple reveals the murderer and the motive. Crime & Punishment in Hawaii, the second in the Grant Kingsley series, is set in 1930s Honolulu when two dramatic real life criminal cases were in the news. The verdict and leniency afterward shocked the local population: whites could even murder a local and get away with it. Woven into the true life cases is a fictional story of Grant Kingsley and his family who become targets of bootleggers. My second noveI series is a trilogy depicting the impact of Westernization on native Hawaiians who had lived an isolated life for centuries. John Tana, An Adventure Novel of Old Hawaii, is the first. In the mid-1800s, my seventeen-year-old orphan hero is kicked off his inherited farm, a kuleana, by a sugar baron. He struggles to understand why and tries to adapt to Western capitalism and religion. After many misadventures and temptations, John sails his canoe to the island of Oahu where he finds Honolulu is more complicated. He complicates his love life. To avoid a henchman hired to kill him, John sails to Kauai. Gods, Ghosts and Kahuna on Kauai, Book Two of the trilogy: On Kauai, John seeks a peaceful life and finds Kauai to be a mysterious, ghostly place of wild boars, sharp mountain peaks hidden by clouds, roaring surf, and traditional Hawaiian beliefs in curses and kahunas. He encounters immigrant Chinese plantation workers, the powerful white elite sugar barons, learns about leprosy, and marries. His Christian beliefs are not accepted by his new family. Hawaiian Rebellions, Book Three of the trilogy: set during the last years of the 1800s. Plantations are devouring land and Hawaiian water in their search to dominate the islands. John encounters two frightening groups of those following the old ways. Tattooed men attack, seeking human sacrificial victims and bring a worse scourge: disease. Thousands of Hawaiians are being sent to a remote island for life just because they are victims of leprosy. Some hide in the remote Kauai valley Kalalau. The government attacks with military weapons and ships victims to isolation. When John's lawsuit brought to recover the source of his farm water ends, he reaches his limits. How can he survive? Then the businessmen overthrow the monarchy. NEW!!! SPLINTERED PADDLE, a novel of Kamehameha the Great NEW!!! 1790: Kamehameha's efforts to unite the islands is at a stalemate. 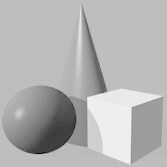 When he witnesses the metal cannon and muskets on the Western sailing ships and the destruction they cause "from afar", he realizes these will make his efforts succeed. This novel begins when Kalani, a seventeen-year-old orphan is sent to the warrior school in order to earn the award of being a "black land chief" and save his mother and sisters from slavery. When he is selected by Kamehameha to be in charge of the western weapons, he learns about military strategy. The battles are fictionalized actual battles at various dramatic parts of the islands of Hawaii and Maui: mountains, ocean, plains, and a volcano. Human sacrifice shocks him, and he learns about the treachery of men and women. So, as I look back on my late teenage years when I wanted nothing more than to be a fisherman, I realize that facing the challenge of Stanford, its law school, the practice of law in California, and then serving as a judge, led to my development as a person, and to a legal career where I believe I benefited society. All in all, it was a very wise decision to listen to my parents and attend college, an opportunity they never had. I learned so much about the world and people. Now I am back home near the ocean and enjoy a relaxed life. Me ke aloha pumehana - May you be surrounded by love. Request more information about why Bill's your Hawaiian author of choice.